Percentages of Healthy Sleep Cycles are shown in the chart above. Our bodies are precisely guided by proper sleep time in each of the four stages of sleep. Each sleep stage in any particular sleep cycle fulfills a distinct physiological and neurological function, each of which appears to be necessary for the health of the body and mind. If sleep is interrupted or if certain stages are missing for any reason, their physiological functions are not fully executed, and the person may feel tired or groggy even after an apparently sufficient amount of time in bed. Over time, these compromises to proper sleep can stress the body and mind to the point where systemic changes take place. This stresses the importance of the “quality” of sleep and not just the time spent sleeping. 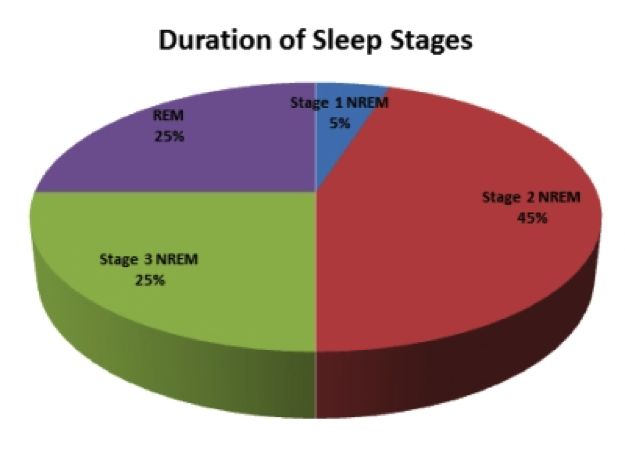 Each sleep cycle is made up of several different stages of non-REM and REM sleep, the overall proportions of which are shown in this pie chart.